Texas authorities said Minnesota Vikings player Adrian Peterson turned himself in to law enforcement after being indicted on a charge of child abuse. Peterson used a branch to discipline his child. He was quickly deactivated by the Vikings for their game on Sunday versus the New England Patriots. Rusty Hardin the attorney who represents Peterson said the charge accuses Peterson of spanking a son with a switch. Hardin said the football player had no intention of hurting the boy. The boy’s age and injuries were not released. Peterson’s lawyer said Adrian never hid from what took place. He has always cooperated fully and voluntarily gave testimony in front of the grand jury for a number of hours. Hardin was quick to point out that Peterson never meant any harm to his son and deeply regrets any unintentional injury. The Vikings said Peterson would be inactive for its home opener on Sunday. This is Peterson’s eighth season with the Vikings and in the NFL. He is considered the league’s best running back and has 10,190 yards with 86 touchdowns over his career. The running back took off practice on Thursday for a veteran day allowing the experienced players a day of rest. A man who called himself Chris Peterson, an uncle of the running back, was at Peterson’s home on Friday and said his nephew was not home. Defense attorney Hardin has a familiar name in sports. He defended Roger Clemens successfully in a recent perjury trial over alleged performance enhancing drugs use. Two years ago, he represented Jordan Hill a forward with the Los Angeles Lakers who received a year of probation after he made a no contest plea to assaulting a former girlfriend. Hardin has worked before with Peterson. 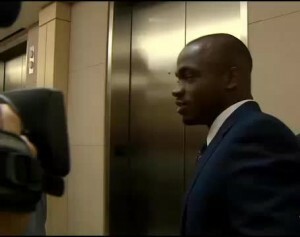 In 2012, Hardin said Peterson had been a victim after the running back was charged with resisting arrest after a nightclub incident in Houston.